Wipaq provides the most wanted equipment for every public place where a large number of people gather in the form of security gate sg100 which is a swing mechanism and can be opened with the electromagnetic ID and password. Easy to work with, is user friendly even by the handicapped individuals. 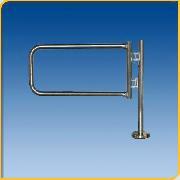 The SG-100 Self Closing Gate or automatic door access gates is constructed from 2" OD satin finished type 304 stainless steel tubing. The hinge post is welded to a 1/4" thick 6" diameter floor mounting plate. The SG-100 comes standard with gravity closing hinges ensuring a gentle return of the automatic gate. The standard clear opening is 36" or 40” making these door access automatic gates compliant with ADA clear passage regulations. Or you can customize any clear passage opening up to 40” at no extra charge. (90 degree single direction opening only). Available with a powerful 600 lb electromagnetic lock powered by 12/24VDC allowing for the use of a card reader or other types of ID devices (90 degree single direction opening only). A Clear acrylic panel can be inserted into automatic gate door opening. Wheelchair decal or custom graphics available.